Thank you for stopping by to enjoy our May Stamp of the Month Blog Hop featuring this month's SOTM - Friendship Bouquet S1205! If you've just arrived here from LeAnne's Blog then you are on the correct path. Let me just start by saying that I absolutely LOVE this stamp set!! It really is a fun one to play with!! 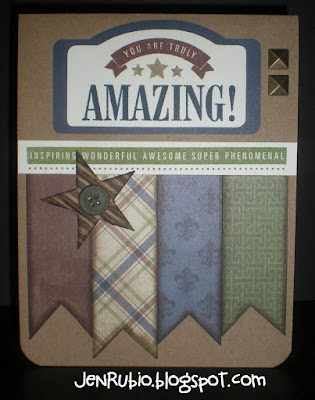 To start, I made this standard-size card featuring the Florentine papers X7153B (above). 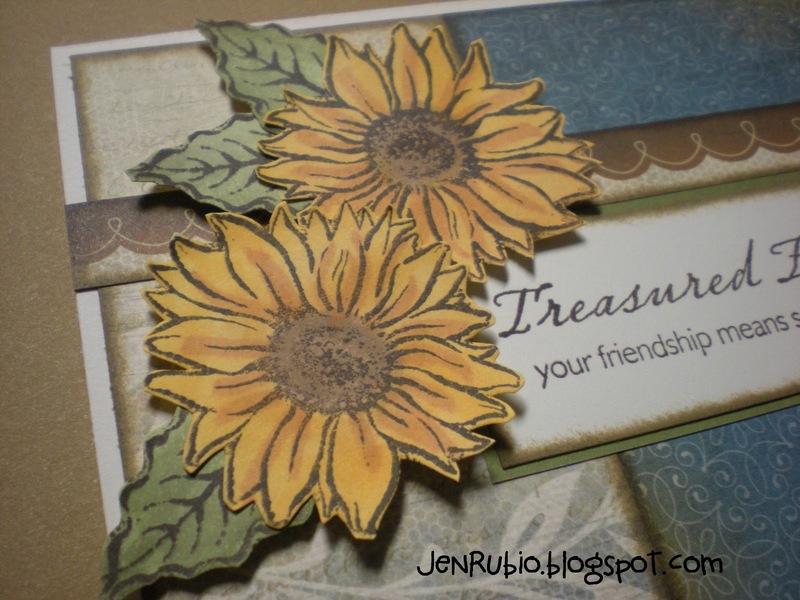 I used a Brown StazOn ink pad Z1142 for my stamping and then colored it in with Desert Sand, Goldrush (for highlighting), and Sunflower markers. 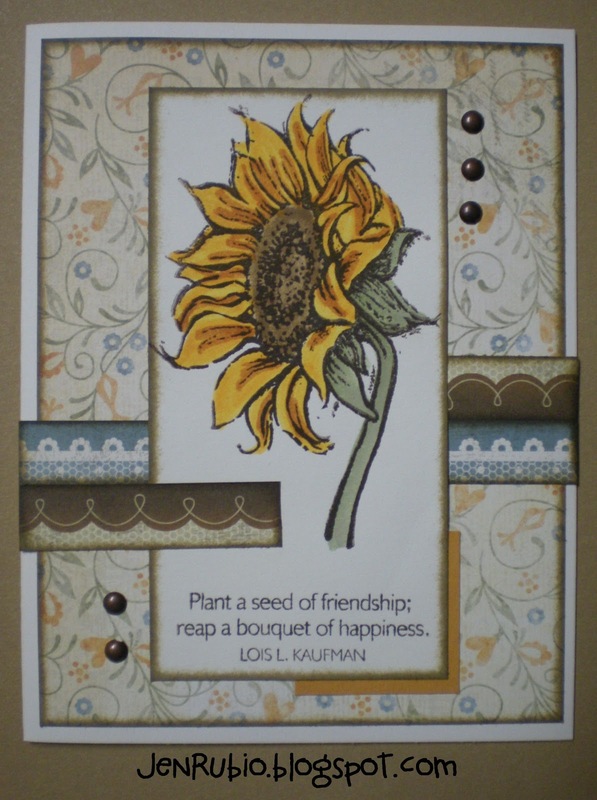 I used a Waterbrush 1771 with an Olive ink pad to color in the stem and leaves only. Using the "StazOn" ink specifically is a very important step to keep the ink from smearing and bleeding whenever you use a water brush for coloring. Pretty simple! Next, I created another standard-size card featuring the Florentine papers again. 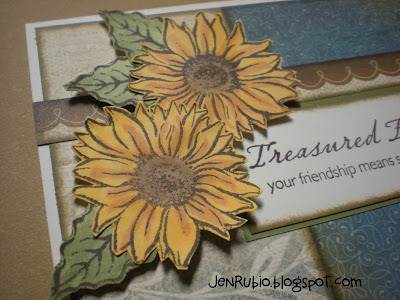 I used a Brown StazOn ink pad for my stamping just like before and colored my leaves with Olive ink and the Waterbrush once again. I used the same color markers just as before, BUT this time I used the Waterbrush to wash over the petals (in a light circular motion) right after coloring them with the markers. This is how I blended the colors and softened the Goldrush marker highlighting to give them the "painted with water-colors" appearance. Now you can continue on with our Blog Hop and be inspired by more creativity with this stamp set by visiting Mary's Blog next! Enjoy!! (Humble Artist's Swap) that I participate in every other month! I feel so lucky to be included and swap creations with these superbly-talented CTMH consultant friends! I always look forward to receiving these stunning cards in the mail and I thank you ladies for inspiring me so much with your creativity! 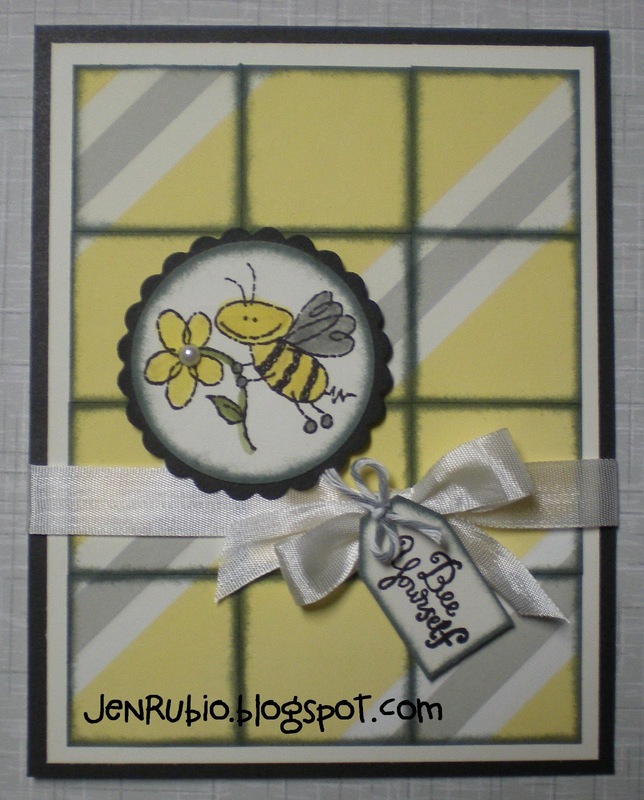 "Bee Yourself" Card for Mojo Monday 238! 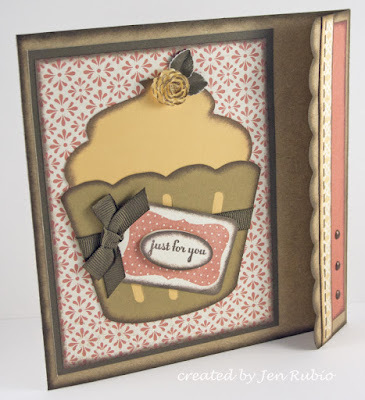 Today I created this standard-size card inspired by the Mojo Monday 238 sketch challenge blog. 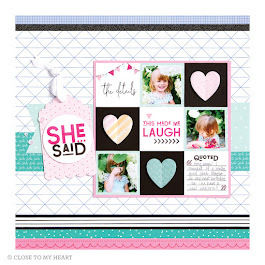 My card features products that are all available from Close to my Heart including the Bee Happy B1374 stamp set with the "Dotty For You" papers (the "Bee Yourself" sentiment is from a past petite perks incentive set W2017). 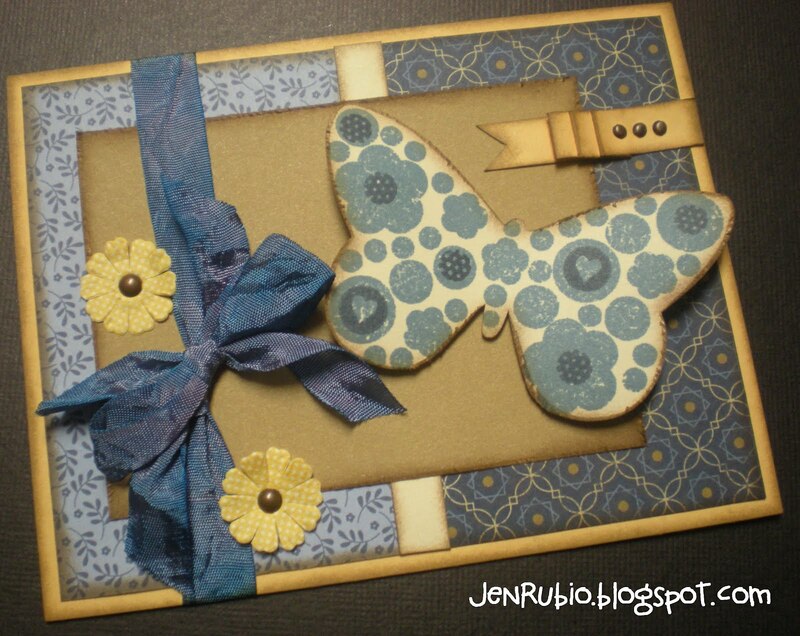 I wrapped my card with Seam Binding Ribbon and then tied my tag onto the ribbon with grey wool Baker's Twine. 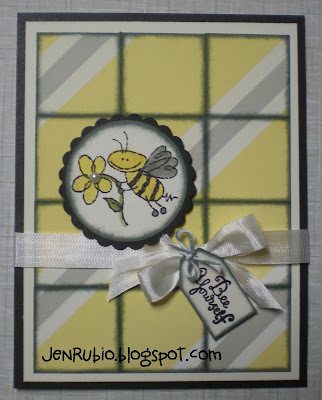 All stamping is done with black ink, sponge-daubed distressing is done with grey wool ink, and I colored the bee image with buttercup, garden green, and grey flannel markers. 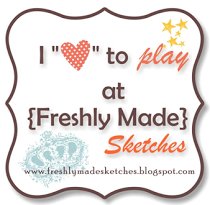 Such a fun sketch to try...I really enjoyed this one and can promise you that I'll be using it again soon!! 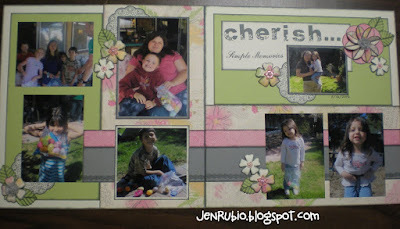 "Dotty for You" card for H2H photo inspiration challenge! 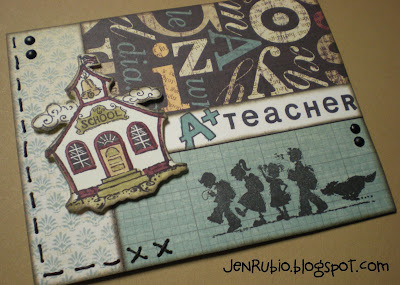 Hand-stitched Teacher card for H2H! 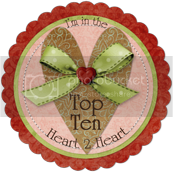 Here's a standard-size card that I created for the Heart 2 Heart blog challenge this week. The challenge was to include stitching of some kind on your creation. I chose to use some hand-stitching with black waxy flax. I didn't use a ruler or a guide of any kind to help me with the spacing of my stitching because I wanted it to look like it was really sewn by hand (and thus, not look too perfect, lol). 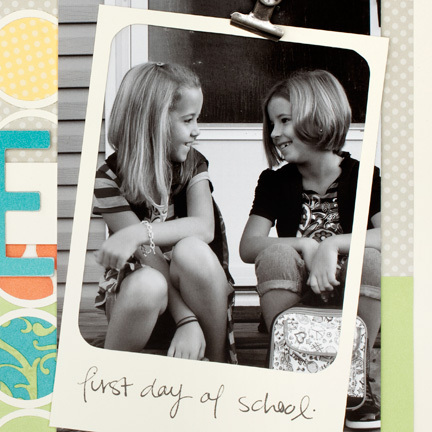 The stamp set I used is School Rocks B1396 with the Typeset paper pack X7139B. Ink pad colors I used include Black, Cocoa, and Juniper (with Bamboo, Parchment, and Vineyard Berry markers for the coloring in of the school house). Teacher appreciation week is coming up in a few weeks, and because I know so many teachers (and am married to one! 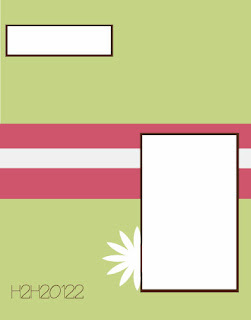 ), I have been trying to think up some card ideas for them. I hope to come up with a few more "teacher appreciation" ideas that I can post and share again soon! 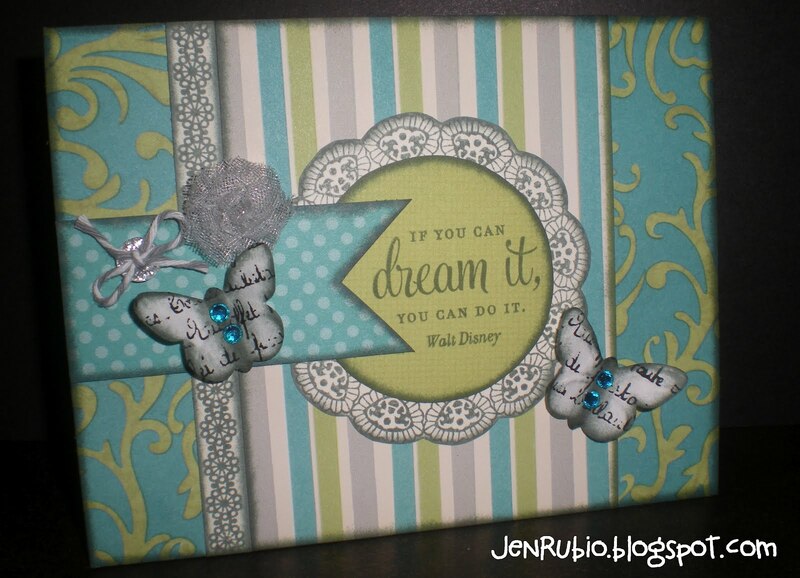 April 20 and 21 scrapbooking classes!! Let me help you make more progress completing more of your scrapbooking this year...one page...and one layout at a time! We meet every month from 6:30pm to 9:30pm on either the 3rd, 4th, or 5th weekend. Join us this Friday night or Saturday night or even BOTH nights if you want or need extra time to create with us! 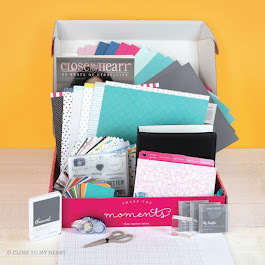 Most layouts only take an hour or two to complete so you aren't required to stay the whole time, but I offer you "up to" 3 hours each night so those who want to can take their time socializing, snacking, shopping, getting extra individual instruction by request, and/or help finishing up any past layouts you might have missed. 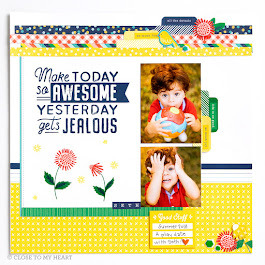 Bitty Buds Assortment Z1690 (a $4.95 value)! 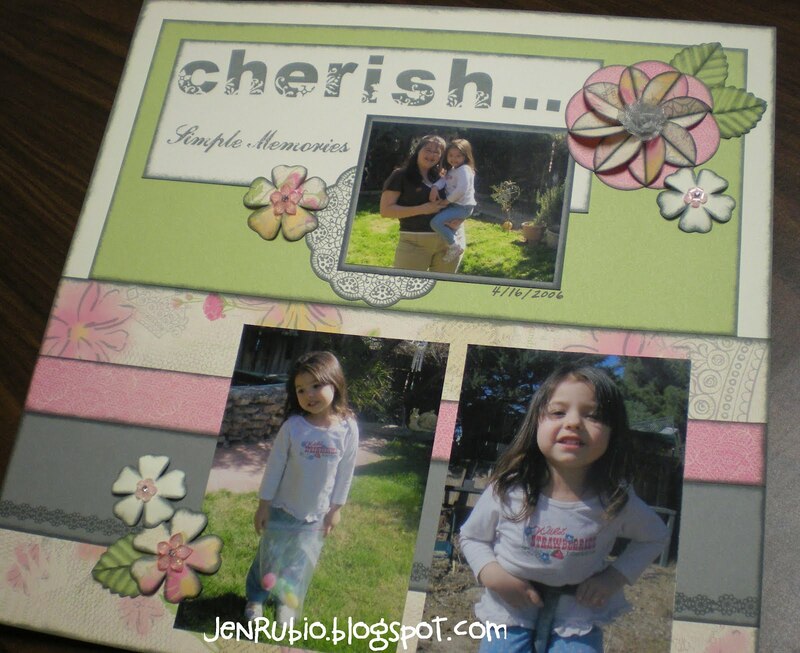 LEFT page - (1) 4.5"wide x 4"tall, (1) 4w x 6t, (1) 3.5w x 5t, and (1) 4x4 square. RIGHT page - (2) 3.5w x 5t and (1) 3.5w x 2.75t. If you want to more closely follow the Magic "Spellbound" layout mine is inspired by you can use (3) 3x3 photos down the far left side of the left page, but since I didn't have smaller photos to use, I just made the two larger photos I had work. 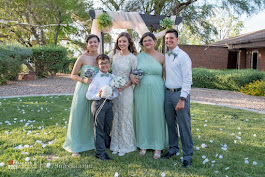 It is okay if your photos aren't cropped to the "exact" same sizes as mine, we can always find a way to make whatever size photos you have work for your pages! 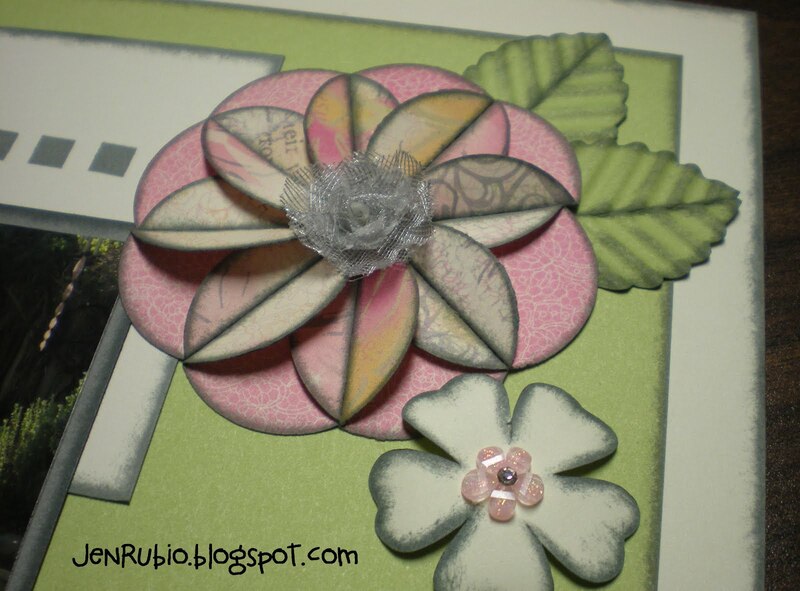 and crimped paper leaves I will teach you how to make! and finally...here's what the Bitty Buds Assortment looks like up close (so sparkle-y)! Victory 12x12 layout ($10) - 9 kits left!! 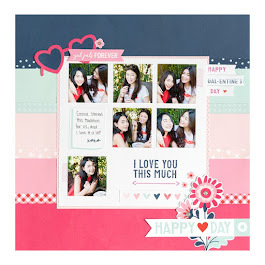 Stella 12x12 layout ($10) - 5 kits left!! 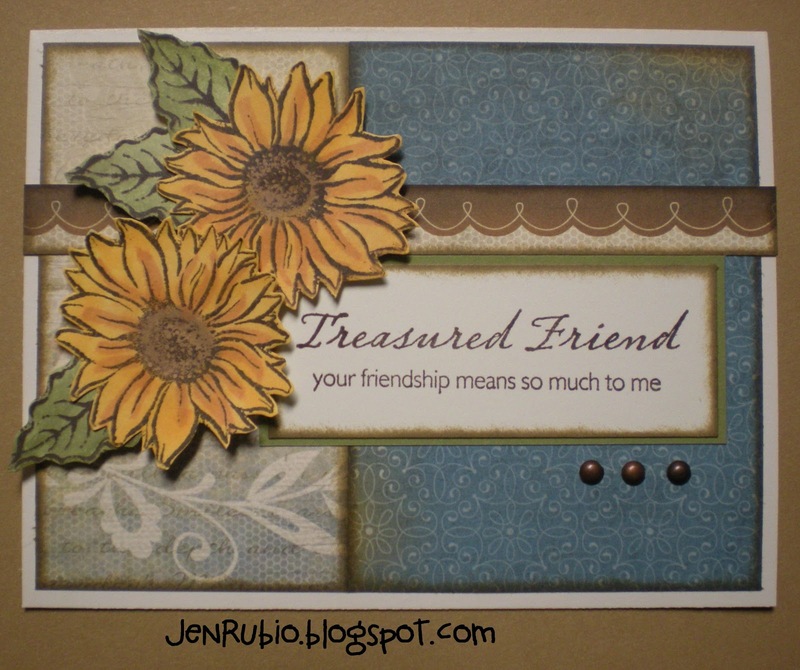 "Dotty For You" Blog Hop!! 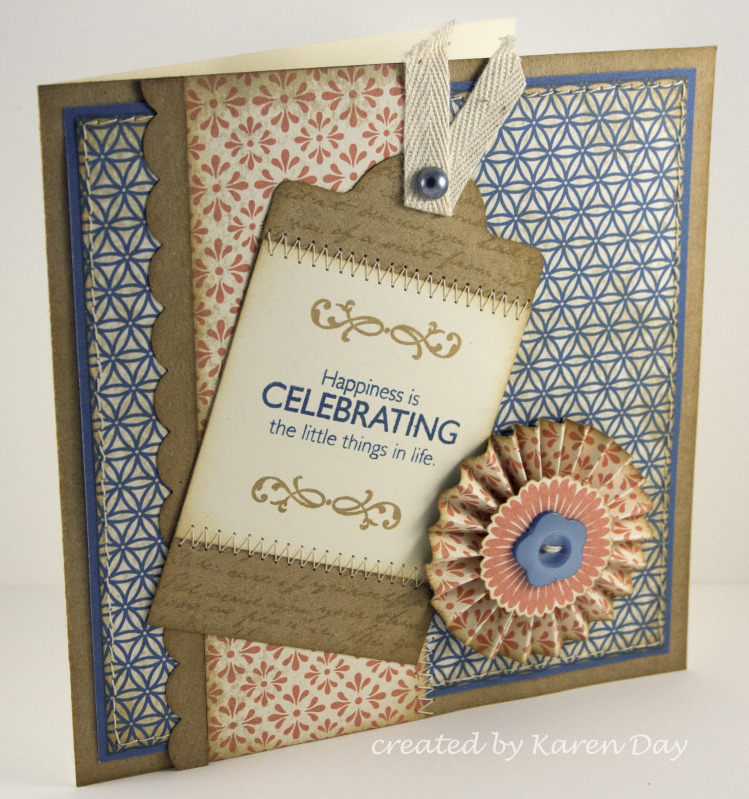 Welcome to our Blog Hop featuring the "Dotty For You" paper pack that is NOW available for purchase to help us celebrate National Scrapbooking Month coming up this May! 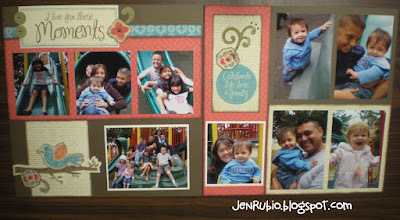 If you've just arrived from Allisa's blog, then you are on the right track. 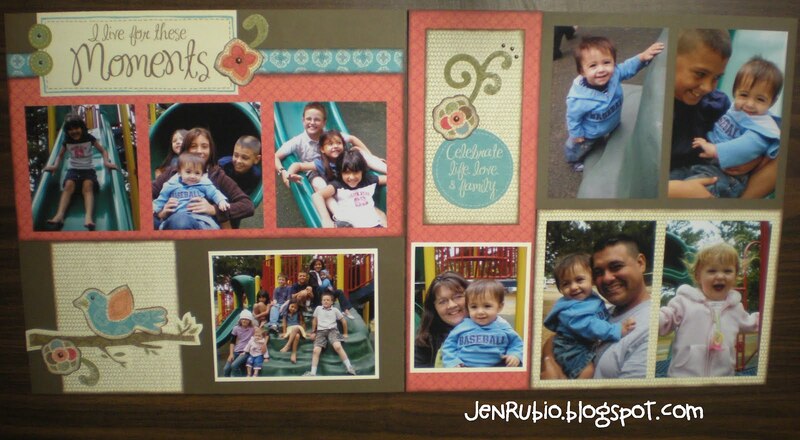 worked so well for the theme of my card! ...and here's one more card I've made with "Dotty For You"
Now you can continue on with the rest of this blog hop and see more creative ideas that use the "Dotty For You" paper pack by visiting my friend Jamia's blog next! Enjoy!! 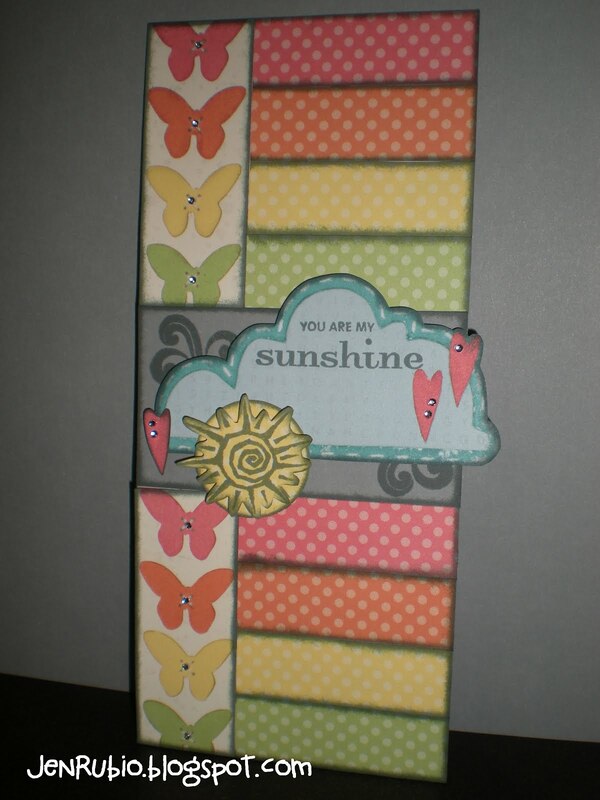 More artwork featuring the "Dotty for You" papers! 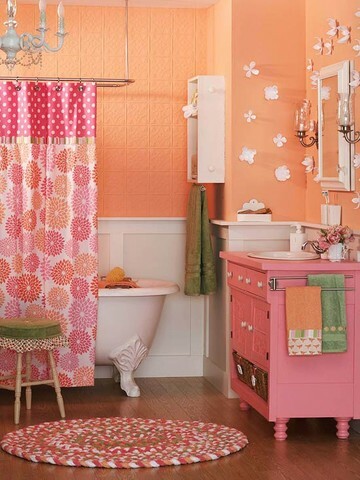 Just sharing one last reminder to get your "Dotty for You" papers now while you still can...and here is more "Dotty" artwork and more creative ideas to inspire you! Available to order NOW for National Scrapbooking Month (May 2012) - the "Dotty for You" paper packet!! Please enjoy this informational video now, then plan to order your paper packet from me anytime before May 31st (while supplies last)!! 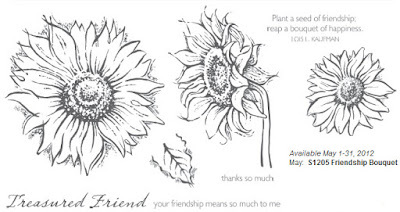 or feel free to contact me to place your order in person, by e-mail, or over the phone if you live locally to me and want me to deliver it to you! A Bow-wow Card for H2H April Sketch Challenge!! 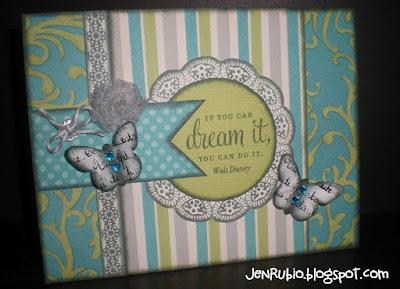 I spent a little time playin' in my craft room this afternoon! 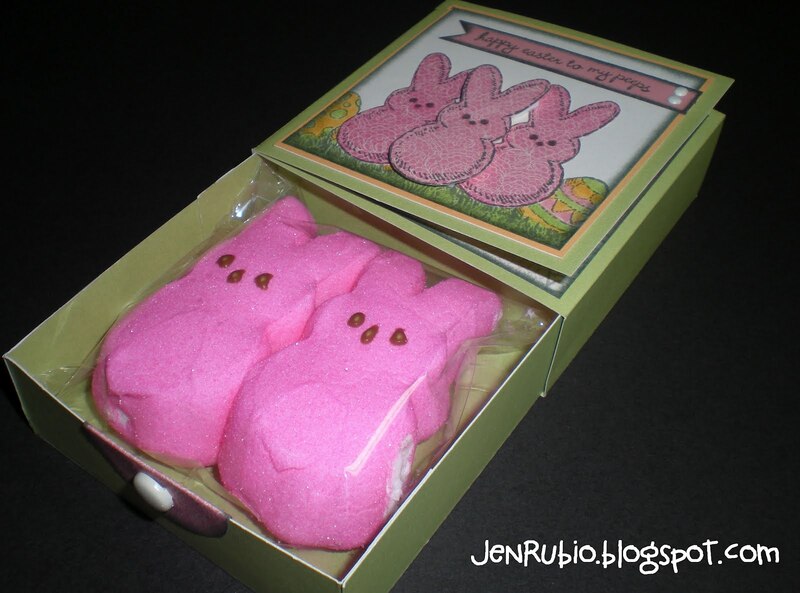 I was saddened to realize that it is already the last day of Spring Break for my kids and I, so I needed a little cheering up. 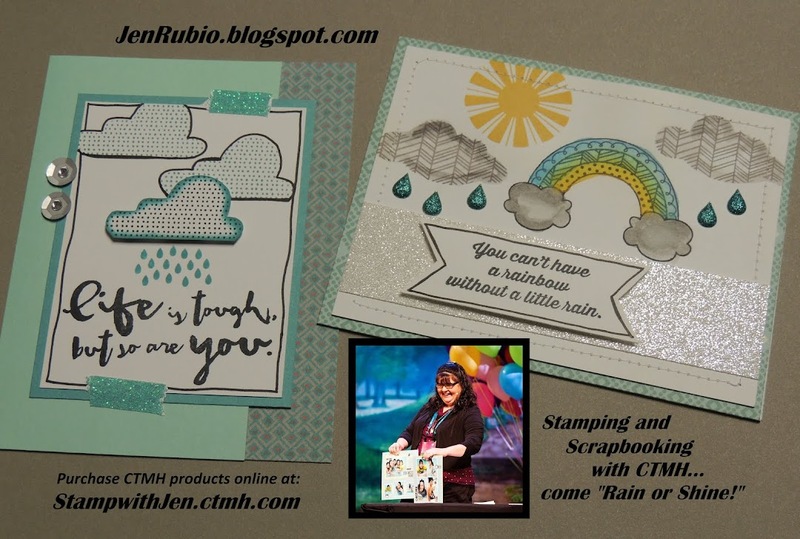 I really enjoyed hearing the pitter-patter of rain and seeing the storm just outside my window while I created. 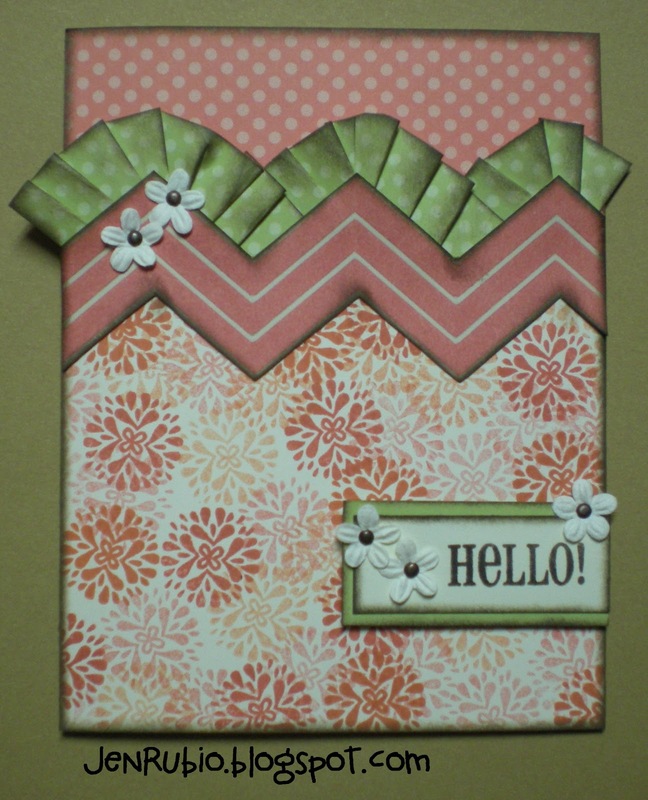 I made this standard-size card using the new "Dotty for You" papers that will be available for customers to start purchasing very soon (April 17th)! I also used just a little bit of one of the B&T patterns from the Cruisin' paper packet X7154B (can you spot it? 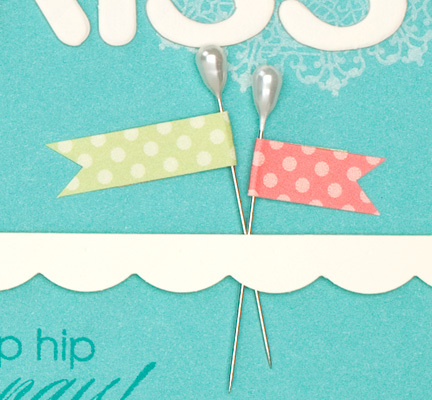 here's a hint...the paper is grey wool in color and it doesn't include dots). I LOVE this bright and bold color combo that makes me feel ready Spring: Creme Brulee, Lagoon, and Sunset with some Grey Wool thrown in as well (don't you know...Grey is the new Black! lol). 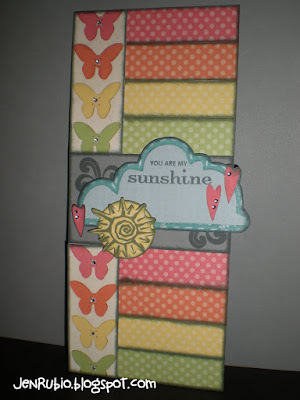 Using these fun colors was just the thing I needed to cheer me up! I also used black ink and a Grey Flannel marker to do just a little coloring and shading on the dog. 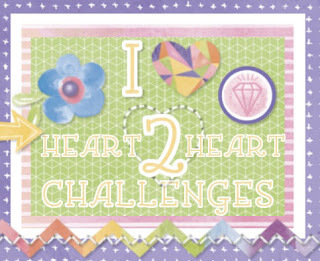 My card design is inspired by this weeks Heart 2 Heart Blog Sketch Challenge! 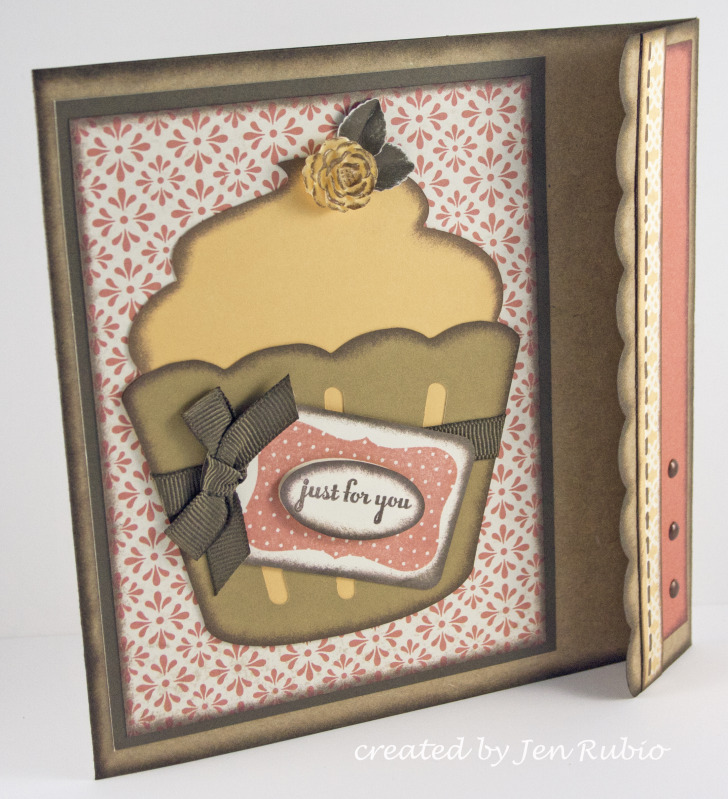 April 13 and 14 Card Classes!! 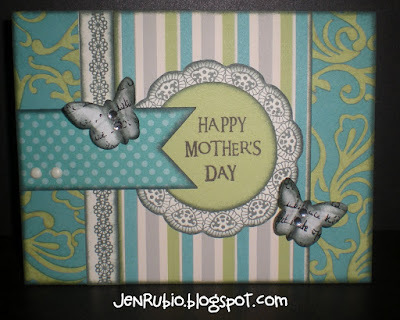 You are invited to join us for my monthly card classes coming up on April 13th and 14th (6:30pm-8:30pm). Join us on Friday night or Saturday night or even both nights if you want more time to create. 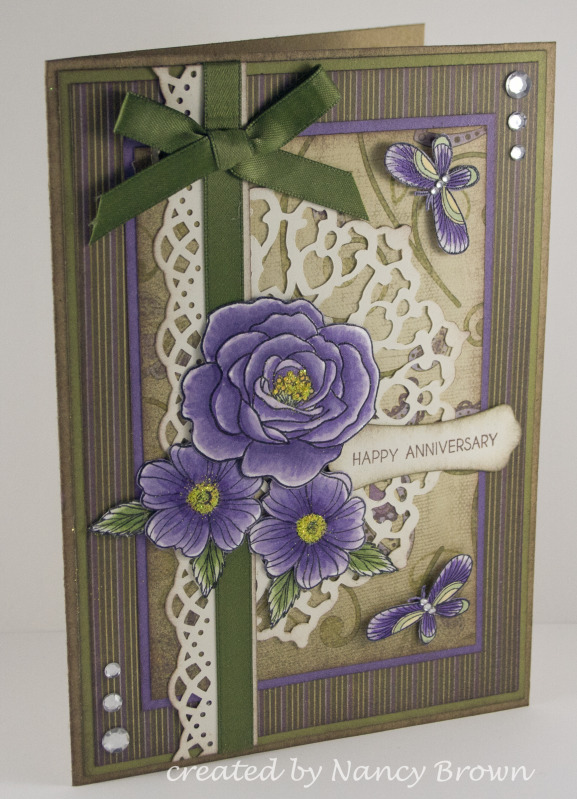 Love Clusters C1484 stamp set, and color-ready seam binding ribbon. with 9-parts water in my spray pen to spray the color on and I also scrunched up the ribbon while it was still wet so it would dry nice and wrinkley! 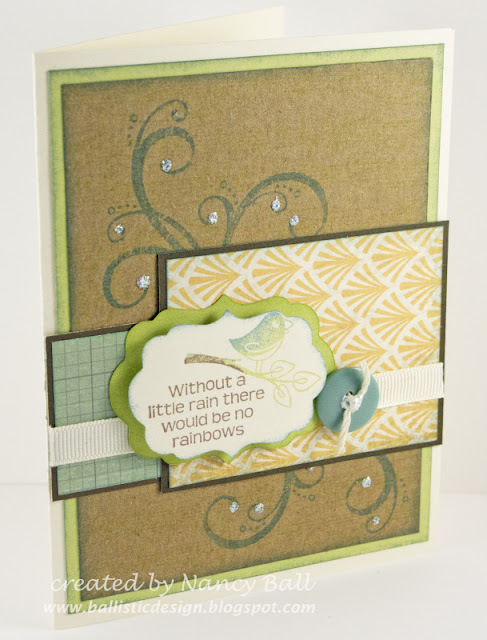 Here is a link to a FANTASTIC video tutorial made by fellow consultant Connie MacFarlane that shows a few different ways to add color to this o-so-versatile and lovely ribbon!! Thank you Connie for inspiring me so much!! and Flutter paper shapes Z1463. 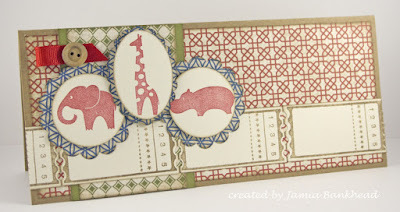 the option to use any sentiment that you want to stamp on your card instead). 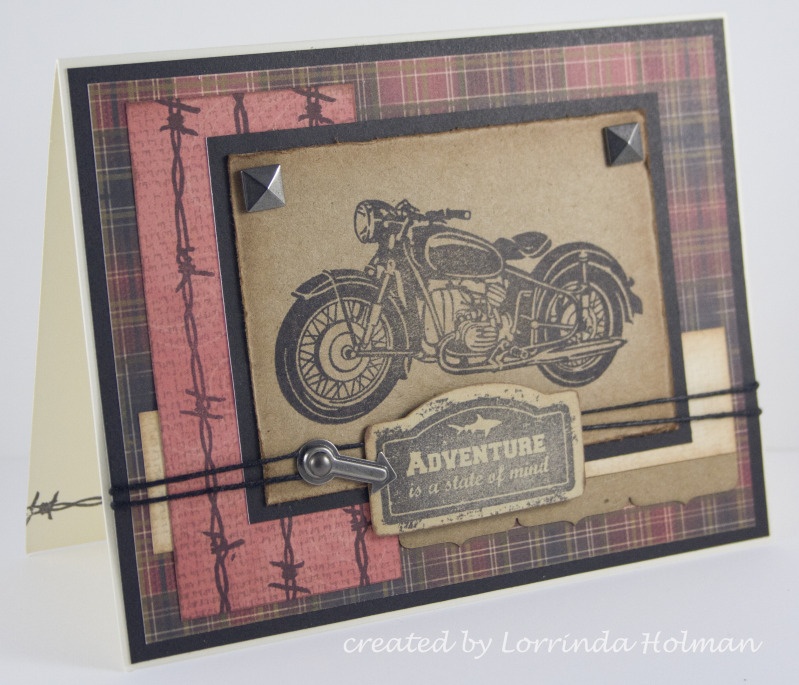 Kraft cardstock (for the card base), and the Victory papers X7150B. Wishing you all a very Happy Easter!! If you are a customer or consultant on my team you should have just received my monthly newsletter for April by e-mail!! 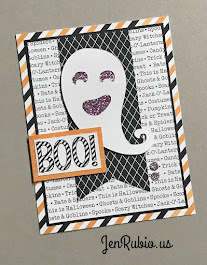 I am so excited about these NEW newsletters! CTMH corporate is providing this new service for all consultants, and it was so easy for me to personalize it just a little before they sent them out for me today. I wanted to be sure that you are all aware that as long as I have your correct e-mail address, you should have received one from me. 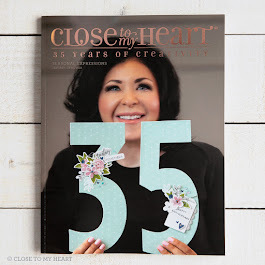 IF you didn't get one, please let me know that you are interested in receiving my future monthly newsletters so I can be certain that you do!! 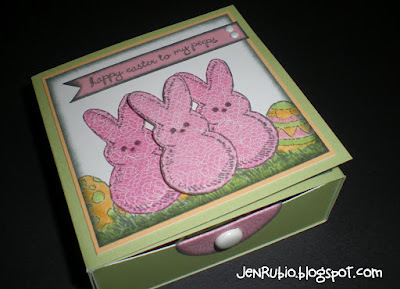 Since the newsletter e-mail that just went out only allows me to include one of my own photos, I thought you might also like to see a few more photos of this cute "3x3 Box Card with Drawer" (below) featuring the "My Peeps" stamp set, "Enjoy" stamp set, and "Lucy" papers (in case you missed seeing it on my blog last month). 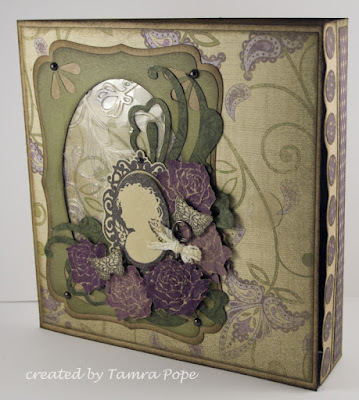 Inside view of 3x3 Box Card with Drawer (below). 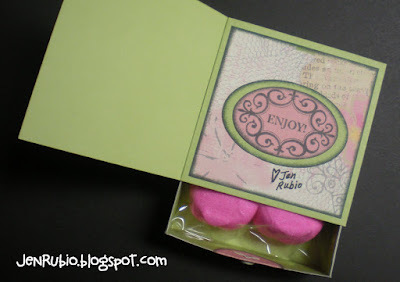 View of what's inside the 3x3 Box Card with Drawer (below). Sat. May 12th (10:30am-8:30pm) - FREE CROP-Til-You-Drop/Potluck! 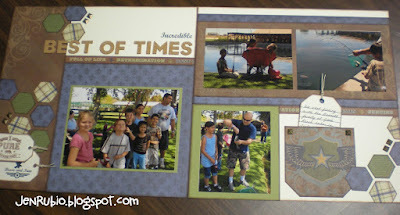 Please come back to visit my blog on the Monday before each class to see photos of what our upcoming class projects will be (or find me on Facebook to see pics there also)! 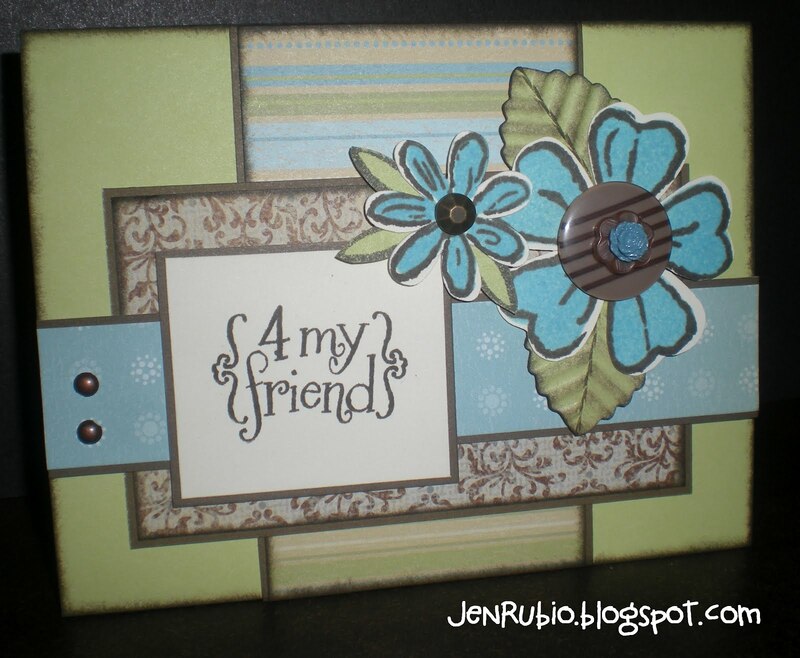 Spring Friendship Card for H2H Challenge! 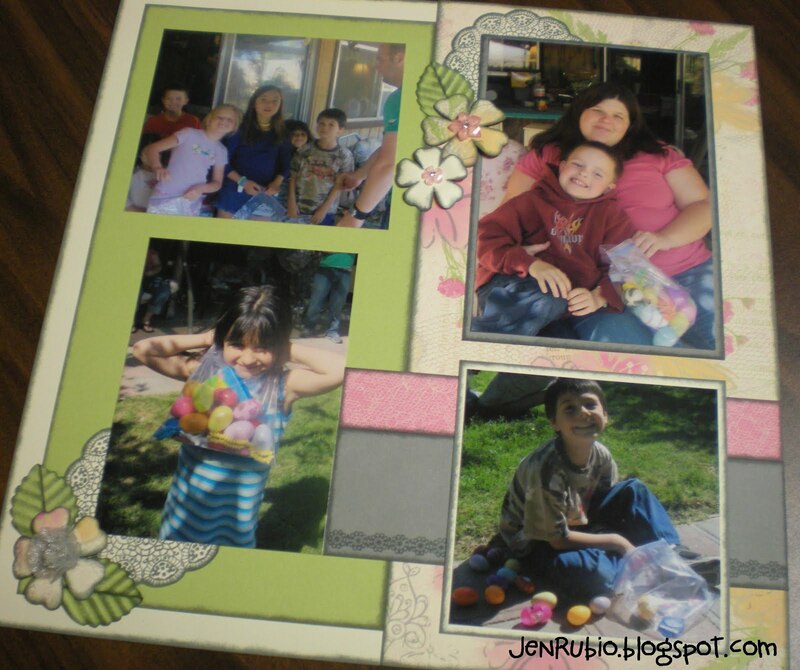 The Heart 2 Heart blog challenge this week was to create something that is Springtime and/or Easter related. 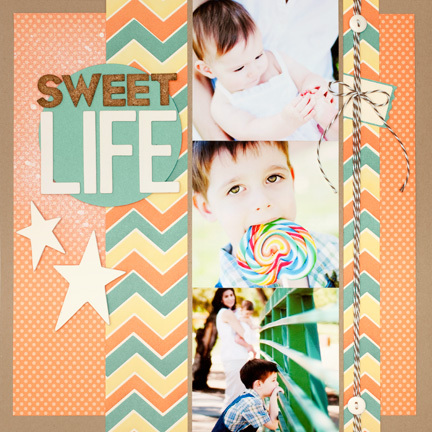 That's pretty much what I've already been creating and posting on my blog for weeks now, so it was a bit of a challenge for me to find time to come up with something else. 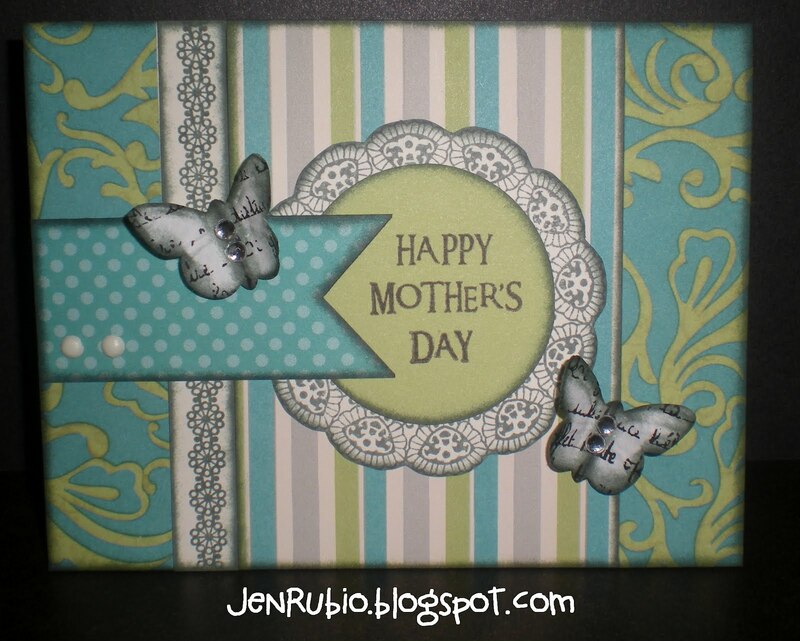 I decided to use up some left-over scraps from last Spring (from the Bliss and Miracle paper packs) to re-make a card design we made during one my stamping classes last year that was one of my favorites (BUT I used some NEW ctmh stamps that I just got instead of what I used before). 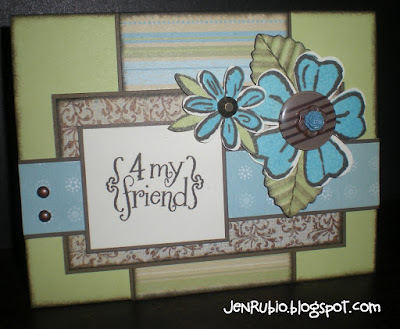 Here is the standard-size Friendship card I made using some lovely spring colors: Crystal Blue, Sky (ink used to stamp the flowers), and Sweet Leaf (with Chocolate and Cocoa added in as well). 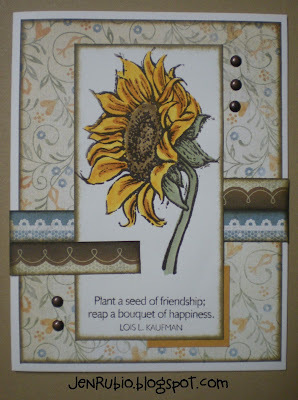 Stamp sets I used include "4 My Friend" D1510 and the "Lucy Workshops-on-the-go" stamp set G1034 to create the flowers. I hope you enjoy! 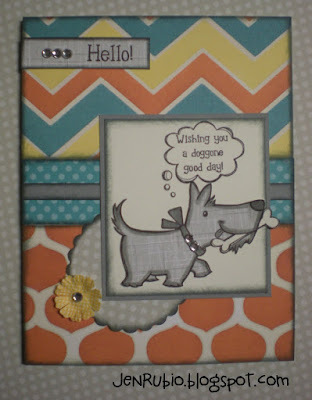 It's Monday and I was so looking forward to getting creative today so...I created this standard-size card this morning using the newest Mojo Monday (Sketch 235) as my inspiration! 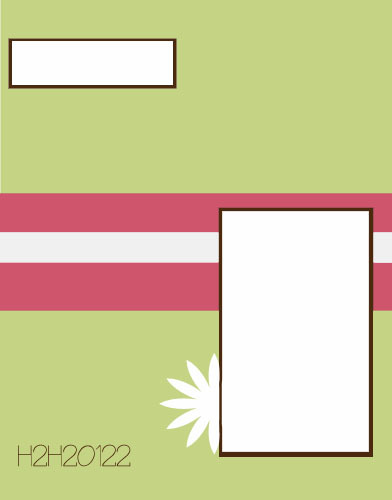 Colors are Colonial White, Grey Wool, Lagoon, and Sweet Leaf. The stamp sets I used include Simple Memories D1472 and Dreams D1500 to stamp the sentiment (you won't find this stamp set in the Idea Book as it is a special CTMH "consultant-only" set I received as a gift for attending Convention at Disneyland last summer). 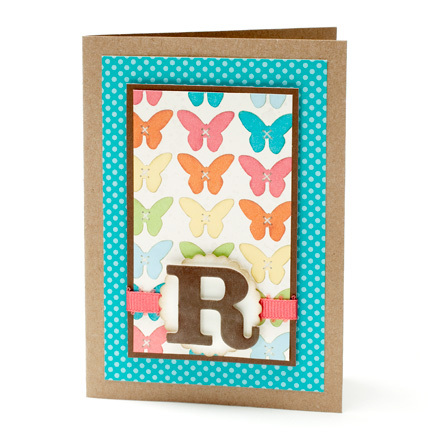 The papers I used are from a brand-new pack called "Dotty for You" that will be available to customers very soon! When you place an order of $35 or more in products from the Spring/Summer 2012 Idea Book between April 17 and May 31, you may add the "Dotty for You" paper packet, valued at $19.95, for just $5! 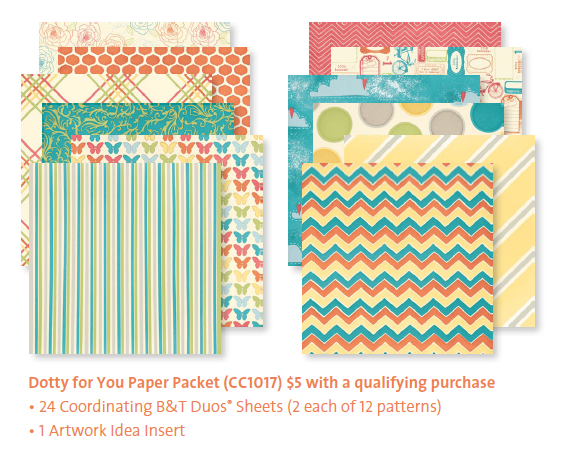 "Dotty for You" includes 24 specially designed, coordinating B&T Duos® sheets (2 each of 12 patterns) and an artwork idea insert to get your creative juices flowing. But that’s not all! 1). Hostesses will receive a free "Dotty for You" paper packet when their Gathering sales total $400 or more (excluding tax, shipping/handling, and Operation Smile donations). 2). New Consultants who sign up between April 1 and May 31 (two full months!) 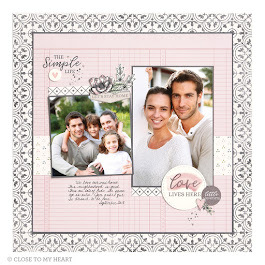 will also receive a free Dotty for You paper packet with their new consultant kit!